Often done in conjunction with Yap or Truk Lagoon, Palau offers big schools of fish, plentiful reef sharks, soft coral and a unique jellyfish dive in Jellyfish Lake. 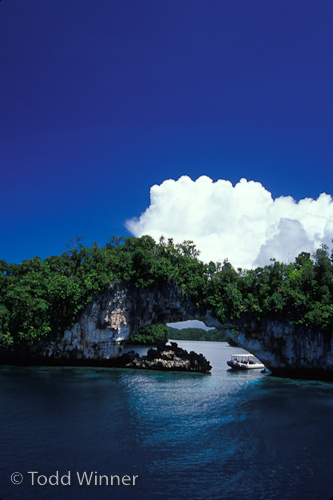 Palau also has stunning topside scenery like picturesque tropical islands. A good selection of liveaboards, fairly easy access from the USA and a good amount of reef sharks ensures that Palau is one of more popular destinations for divers. Reef Sharks - on many of your dives you'll see a few reef sharks below 50ft, such as whitetips, blacktips, and grey reef sharks. They can be difficult to photograph because they like to keep their distance. 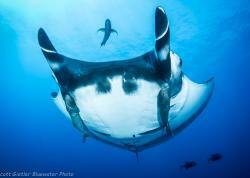 Manta Rays - you might see a manta if you are lucky, but they will be more prevalent at Yap. Jellyfish - you can see some jellyfish floating by on your safety stops, during your safety stops, and of course there is Jellyfish Lake. 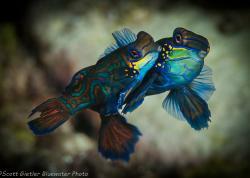 Mandarin Fish – Palau was one of the first destinations well known for mandarin fish dives. 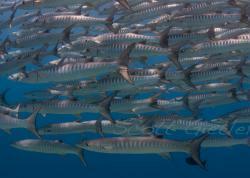 Schools of Fish - lots of snappers, grunts, fusiliers and some large groupers. Drift dives are common where the boat follows you along in the current. Reef hooks are common. 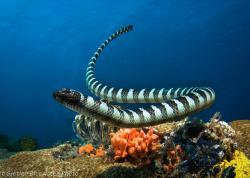 A reef hook is basically a big fishing hook with the barb removed, and a 3ft length of rope. The rope hooks to your BCD, and hook goes into a dead part of the coral reef. Reef hooks are fairly well accepted in Palau because there's usually a good amount of dead coral to hook into. You generally drop down to 50ft depth, and either go with the current or hook in with the reef. There's some healthy hard coral, and a good amount of wall diving. You should be able to get in 5 dives a day with a night dive. Blue corner has a lot of current, which brings in the big fish. Use of reef hooks is common. 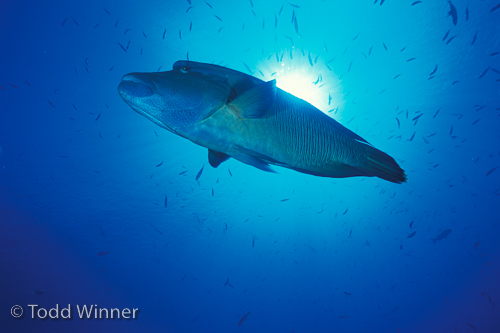 Sharks, Jacks, Tuna, and resident Napoleon Wrasse come by in the current. Jellyfish lake is snorkeling only. 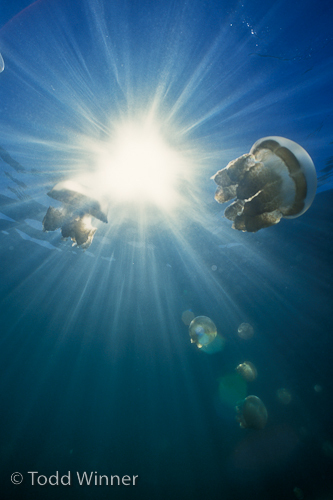 The lake is filled with harmless picturesque jellyfish – the perfect underwater photography subject. 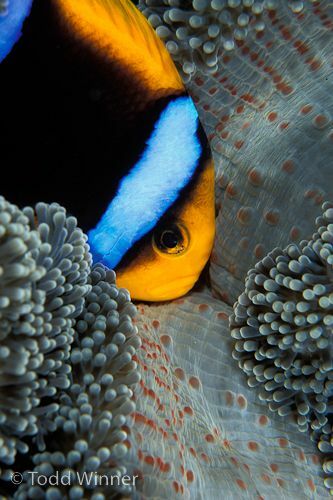 For many photographers, this is the highlight of their Palau trip. 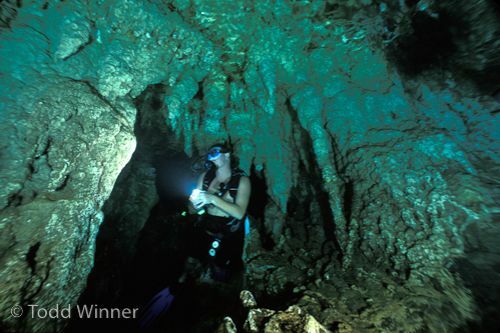 This site is a large cave with several “rooms”, and is imho for experienced divers only. You can enter the cave at 25ft, and surface in different “rooms” in the cage. You take underwater tunnels from room to room. This is a very cool place, and a good place to take a wide-angle photo with a diver. It's a very adventurous dive that must be done at the right time of day with an experienced guide that you feel comfortable with, and experienced divers - because, like all cave diving, visibility can drop to zero, and you can have trouble finding your way out. This is an overhead environment, there are places where you can't see any light, and it should be taken seriously. If they don't use cave lines you should check compass headings and have backup lights. 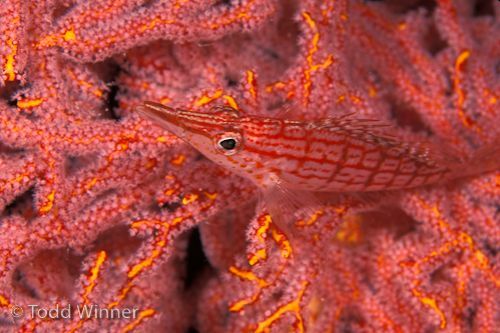 Read about a big lesson learned by an underwater photographer while diving this site. Flights from the USA stop in Guam, and then continue on direct to Palau. 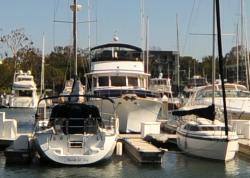 Once you land, you can basically get on the boat and start diving. The best time to visit Palau is December to April. Water Temperature is general 81-84 degrees Fahrenheit. It can be difficult to get reef sharks to come close to you while you are hooked in at Blue corner. Unhooking and swimming down into the reef over the lip of the reef can get you closer to sharks, but you also risk the ire of other dive groups who fear your bubbles will scare away the wildlife. It's best not to chase sharks, but to find a good spot where they can swim by you in the current. 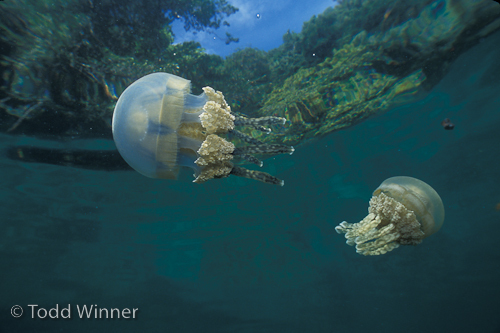 For Jellyfish lake, use a wide lens so you can get close to the jellies. Use a wide-angle lens and dome port to try to get some amazing split shots. If you get close to shore and stay shallow, you can also get the mangroves in the background – in either an over-under shot or an underwater shot. Most people visit Jellyfish lake for only 1 day, but it might be worth it to arrange for 2 days there if you are an avid underwater photographer. 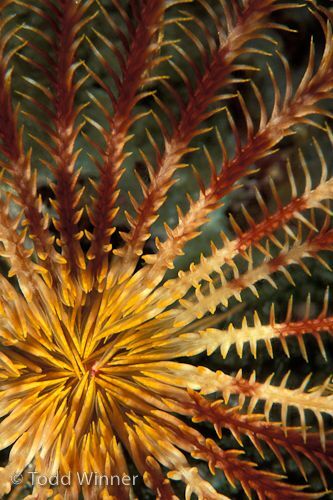 Night dives are often the best time to put your macro lens on. The Palau Pacific resort is also convenient as a 1-2 day stop either before or after boarding a Palau-based liveaboard boat. It is a great way to arrange a tour of Koror and neighboring islands. Activities include a dolphin research station, waterfall hikes, rock island excursions, speedboat & kayak charters, city tours and more. Kayaking in calm blue waters among the islands is a must-due activity during your no-dive day. There's also great World War II historical artifacts to see, such as rusted out tanks and Japanese caves. Submitted by jeff smith (not verified) on Tue, 2011-12-13 04:25.
amazing photography thumbs up (Y). Submitted by Todd (not verified) on Fri, 2010-05-07 17:37. Submitted by Julie (not verified) on Fri, 2010-05-07 10:21. You must not have spent a lot of time in Palau. First, it's Koror. Second, the dive spots are about 45 minutes boatride through the Rock Islands from either Palau Pacific Resort (not on Koror) or one of the dive services. 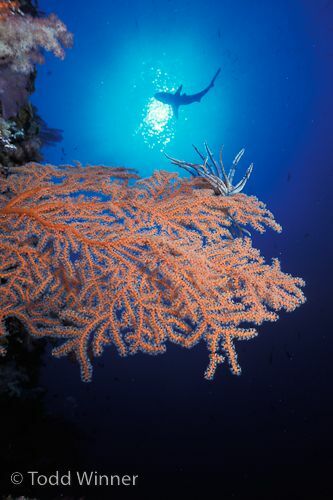 Third, there are lots of sharks at Blue Corner and they will pass within a few feet of you on your 5-6' reef hook line. 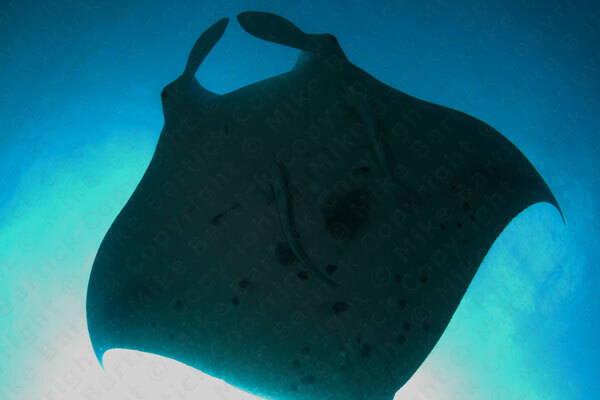 There are also resident spotted eagle rays at Blue Corner. I have seen as many as four mantas at a time at German Channel, usually in December or January. Finally, Chandalier Cave is not as scary as you make it sound. It is shallow and you can see daylight from almost anywhere in the cave. Just stay in view of your divemaster and carry a flashlight. I hope you enjoy Palau more if you get back there.